UPDATE :Naketa Leiba, 17, was found by detectives at a friend’s apartment in the 8400 block of Sherman Circle in Miramar. CBSMiami reports she gave a sworn statement that she ran away, and had not been coerced or held against her will. 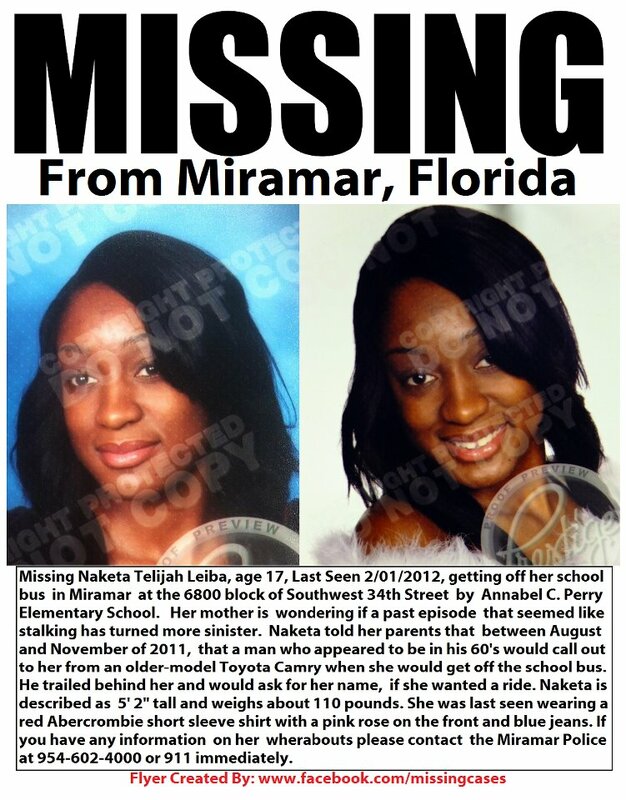 Naketa Leiba, 17, went missing while walking home from school last week in Miramar, Florida. Police have not ruled out that she ran away, but her mother, Sharon Leiba thinks she may have gone with someone she knew and now is being held against her will. “If she is watching this, just do whatever they want you to do, and if the person who haves her is watching this, please know that she has family that love her,” Sharon told NBC Miami. Naketa called her mother to tell her she was on her way home, but she never made it. Sharon is also worried that maybe a man that was stalking her daughter last year, might have something to do with Naketa’s disappearance. “He trailed behind her and would ask for her name, if she wanted a ride,” said Sharon. Volunteers plan to meet at Washington Park at 9:00 a.m. on Tuesday to search for Naketa. Naketa is 5’2″ tall, 110 pounds and was wearing a red Abecrombie short sleeve shirt with a pink rose on the front and blue jeans. If you have any information, please call 954-602-4000.